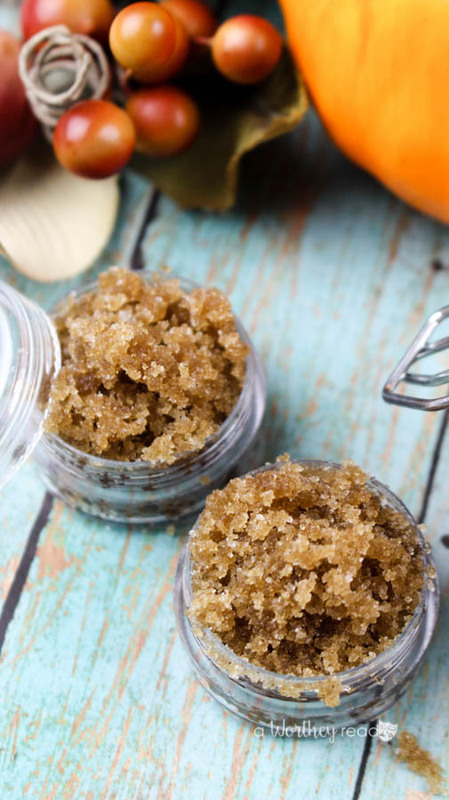 Our Pumpkin Spice DIY Lip Scrub is one of the easiest and best homemade beauty products you will ever make. If you are a fan of pumpkin spice smells and flavors, this is going to be that item you never knew you needed all your life. It’s that amazing and luxurious for your lips! I am a huge fan of pumpkin spice, and since I keep all of these ingredients on hand in my house anyway, it was easy to imagine throwing these together could create a fun and great DIY lip scrub. With cooler temperatures of all here, and the windy weather here in Michigan almost always leaving my lips a bit chapped, I need this on hand for a bit of pampering before moisturizing with my regular lip balm. You can make and store this in a large lidded glass jar, or put into smaller lip gloss containers to gift to your friends. Remember, however, that the oils in this can leak out easily and on occasion make it messy. So, just be careful about tossing this into your purse. You’ll want to keep it in the bathroom. It is a scrub that moisturizes, not a lip balm. 1. In a small bowl, whisk the sugars and pumpkin pie spice together. 2. Add the almond oil and stir to mix well. 1. Wet your lips with warm water and apply the pumpkin spice sugar lip scrub. Enjoy the sweet pumpkin pie aroma! 2. Gently rub your lips in a circular motion. Both sugars are great for exfoliating and the almond oil helps with moisturizing your lips. 4. Apply your favorite lip balm. Whether you want your lips to be smooth for kissing your spouse, or you simply enjoy a bit of at-home pampering, this is a great solution. This Diy Lip Scrub backs a great pumpkin spice flavor you’ll love, alongside all of the rich moisturizing oils your lips need during the cooler seasons. This looks amazing! Our To grandma’s house we go link party starts over at our place tomorrow morning, would love to see you there!